University of Illinois, Champaign, Il. 1970-1974 B.S. Biology. University of Illinois, Chicago, Il. 1974-1978 M.D. Greenville Hospital Systems, Greenville, S.C. 1978-1979 Flexible Intern. About Robert S. Baer, M.D. Dr. Baer views himself as a “family practitioner” for the skin. He sees the patient as a whole person and enjoys knowing and treating family members regardless of their age. Thirty years of experience helps him recognize and treat most conditions. For many consecutive years he has been voted “Best Doc” in the area. Always looking for a “tech solution,” he designed InTeleDerm to provide easier access to dermatology services. Dr. Baer has always been visually intrigued. Art, photography and nature he loves to see. Always looking for a tech solution, he designed InTeleDerm to reach out to many people. Welcome to the service and please give any comments. Thanks. "We saw Dr. Baer. He is an excellent doctor and very personable. I never thought I would look forward to a doctor's visit. He is professional with a comedic flare." 'I was amazed at the friendliness and knowledge of the entire staff and Dr. Baer! My checkup was very thorough and I was so pleased! Thank you!" "...My main impetus in using this practice is Dr Baer. No one could make the visit any nicer than he always does. He addresses every concern with professionalism and great kindness. 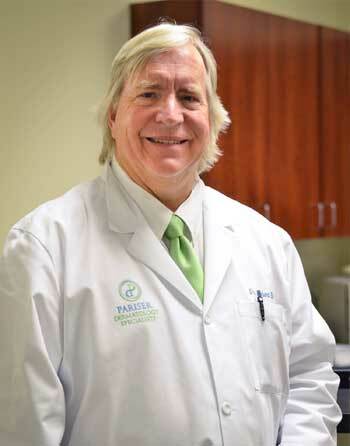 I drive from Virginia Beach in order to see him, and will continue to do so..."
"I think Dr Robert Baer is an excellent dermatologist that does not rush his time with patients. He is probably the most experienced dermatologist practicing in the area and I appreciate the benefits I have derived from that broad experience. I also like the friendliness and cheerful of the folks in Reception and back office staff." "I don't know that I've ever had a more enjoyable doctor's visit. Loved the staff and Dr. Baer is so genuine and made me feel at ease." "I would drive a country mile if necessary to maintain Dr. Baer as my dermatologist. He is on my list of keeper doctors. Thank you Dr. Baer"